Introduction: Body mass index > 30 is a preoperative predictor of failure after antireflux surgery, limiting therapeutic options for obese patients with medically refractory GERD. This study seeks to evaluate outcomes after two different endoluminal GERD therapies for these patients. Methods: Obese patients (BMI>30) presenting with medically-refractory GERD underwent either a single endoscopic full thickness (EFT) suture placement of the gastric cardia by NDO Plicator or radiofrequency (RF) energy delivery to the lower esophageal sphincter with Stretta. Primary outcome was failure where this was defined as absolutely no symptomatic improvement and/or subsequent antireflux surgery. Secondary outcomes were symptom scores (heartburn, chest pain, regurgitation, dysphagia, cough, asthma, hoarseness) and proton pump inhibitor (PPI) use. Data were analyzed using non-parametric statistical tests. Results: A total of 22 patients underwent endoluminal therapy for medically-refractory GERD (10 EFT and 12 RF). Average BMI was 39.6 and 38.6, respectively (p=0.3). Mean follow-up was 1.5 years. There were no treatment associated complications. The failure rate for the entire treatment group was 28% (10% EFT vs. 42% RF, p=0.1). There was significant reduction in moderate/severe symptoms as a result of endoluminal treatment: chest pain 13% vs. 9% (p=0.04), cough 36% vs. 22% (p=0.03), voice changes 36% vs. 9% (p=.012), and dysphagia 32% vs. 9% (p=.04). There was a trend towards reduced PPI use for the entire group after endoluminal treatment (81% vs. 50%, p=0.1), with most of the reduction in PPI use in the EFT group. Conclusions: Endoluminal treatment can reduce GERD symptoms for some obese patients, although there is significant continued PPI use. 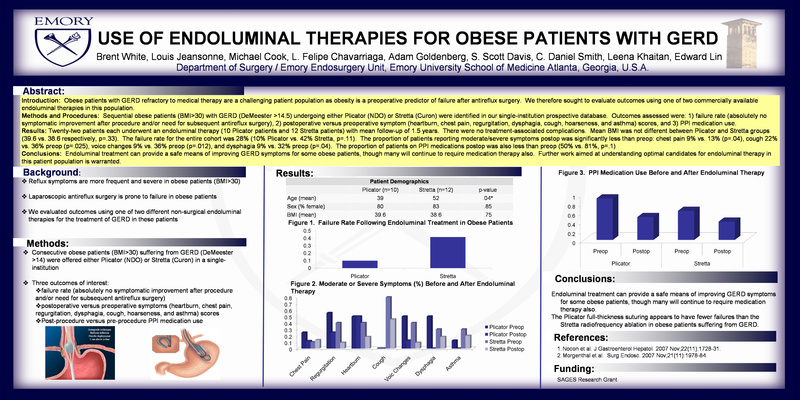 This study emphasizes the need to further refine patient selection for endoluminal GERD therapy in obese patients in order to optimize outcomes.